All nerdy government paper pushers look like Robert Redford, right? Every day, Watch This offers staff recommendations inspired by a new movie coming out that week. This week: The throwback D.C. conspiracy theories of Captain America: The Winter Soldier have us thinking back on the best political thrillers of the 1970s. Robert Redford may seem too handsome and charismatic to play an everyman, but he comes close in Three Days Of The Condor, the fourth of his seven films with director Sydney Pollack. Redford plays Joe Turner, a CIA nerd who combs through novels for codes and clues at a Manhattan office disguised as the American Literary Historical Society. When Joe steps out to pick up lunch, he returns to find the rest of his office murdered—a discovery Pollack scores with the relentless, grim rattling of a dot matrix printer. It’s not the movie’s only piece of surprisingly unsettling sound design; there are also Christmas carols trilling in the background of multiple scenes. Throughout the movie, Pollack elevates workaday surroundings into settings of possible menace, mirroring the way that Joe arrives at work placid and leaves paranoid and jittery. He’s obviously not suited for isolation in the field—when he calls the hit into the main office, he can barely remember that his code name is “Condor.” But he does have the instincts to sense that something is amiss. After an attempt to bring him in goes badly, Joe sets off to investigate the situation himself. Redford excels here playing a guy struggling beyond his comfort level: Joe’s predicament doesn’t awaken an inner badass, instead just highlighting that he’s both resourceful and in over his head. That he might look, at a glance, like a rogue super-spy while barely surviving his scrapes becomes both a mordant unspoken joke and part of the movie’s sense of constant danger. This tension extends to Joe himself: His supposed decency doesn’t stop him from abducting Kathy (Faye Dunaway), a random bystander, and forcing her to help him. Their relationship starts off Stockholm creepy (when he listens in on Kathy’s phone call to her boyfriend, Pollack keeps the camera tight on their shared frame, giving the scene uncomfortable intimacy) but redeems itself through some crisp, rueful dialogue. 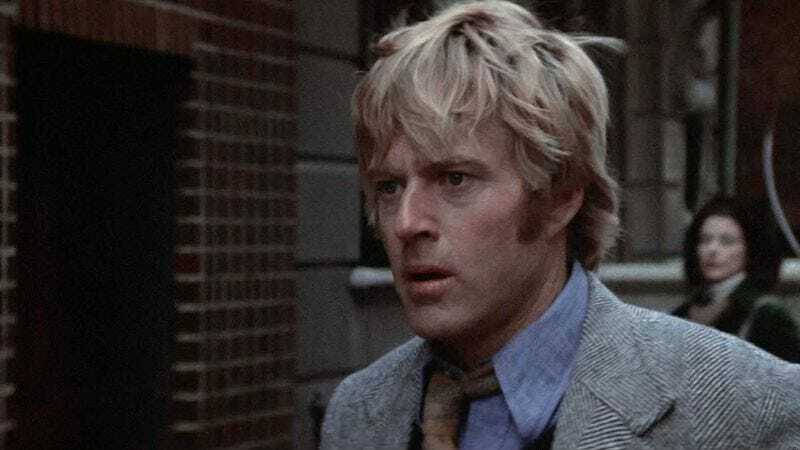 The timeframe of Three Days Of The Condor was shortened from the six days of its source novel, but Redford nonetheless appears to age about a decade over the course of the film. He’s a perfect embodiment of an American who may approve of CIA skullduggery in theory, but turns out appalled by the actual practice. That all-American outrage and paranoia would pop up repeatedly through the rest of the actor’s career. Availability: Three Days Of The Condor is available on DVD and Blu-ray, which can be obtained from Netflix, and to rent or purchase through the major digital services.